One of the suspects is placed in the back of a police van. Police arrested ten people after a number of drugs warrants were executed across Northumberland this morning (Thursday, July 5). Eight men and two women were arrested on suspicion of conspiracy to supply Class A drugs. 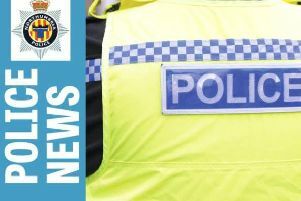 They are assisting police with their inquiries after officers visited eight addresses in Ashington, Bedlington and Widdrington. A Northumbria Police raid on one of the properties this morning. Detective Chief Inspector Jon Bensley says the activity is part of a larger strategy to tackle a range of offences – including violent crime which could be linked to the use and supply of Class A drugs. He said: “The warrants we have carried out today are prime examples of the robust response we will take to proactively target those believed to be involved in criminal behaviour. A large part of our operation is responding to reports and intelligence that comes to us from the community. “There is no doubt of the harmful impact drugs and drug dealing has on these communities and we are absolutely committed to pursuing those who think they can get away with it. “Our message is clear: Anyone we suspect to be involved in this type of crime will be targeted by police and we make no apology for this tough stance as we continue to carry out work to make our communities even safer. A door is rammed by police officers. "By working together with residents, businesses and other partners we can make Northumberland a safer and more pleasant place for residents. We would ask people to continue to help us by calling 101 when they do see any suspicious activity in their neighbourhood." Anyone who is affected by issues concerning drugs or alcohol, either for themselves or family members, should seek support. Help can be accessed in a number of ways. For more information, visit www.talktofrank.com for advice and service support.